Doing yoga might be the last thing on your mind when you wake up in the morning, but practicing yoga first thing, even just for a few minutes, has many benefits. 1. It helps to wake you up! Yes, you will leave your mat feeling more awake than when you got on it. 2. It sets the tone for the day. Waking up and following the breath through some gentle yoga stretches will keep you calm throughout the day. Alternatively, taking some easy stretches and then firing up the body with some sun salutations or vinyasa flow can make you feel alert and energised for the day. 3. It can improve your concentration. When you spend time focusing and tuning into your breath, you become in to the present and it can help you stay this way throughout the day. 4. It helps to keep you on a healthy path all day. After you have practiced yoga, you will feel good about yourself and then will want to treat your body to healthy meals and drinks for the rest of the day. 6. It increases your metabolism. Like all exercise in the morning, it helps to kick start your metabolism ready for that super healthy breakfast. 7. It’s like a giant satisfying yawn and stretch. Just think, you have been laying down not moving for 7-8 hours, so what your body needs is a nice stretch to lengthen all those muscles and get the blood pumping into them once again. 8. You won’t find excuses not to practice. By practicing first thing in the morning, nothing that happens throughout the day can make you skip your practice for that day as you get it done and out the way first thing in the morning. I’ve embarked on a morning yoga practice and have been doing it everyday now for 20 days. I know this probably doesn’t sound like a long time (I have practiced yoga regularly for over 10 years, but have never stuck to a morning practice) but I have begun to notice the benefits of a morning practice shine through and notice the positive impact it has on the rest of my day. So why not give it ago and see the benefits you begin to notice and see if you can add to my list! Remember to set your alarm a little earlier than normal in the morning to give you enough time to get yourself up, drink made (I enjoy hot water and lemon during my practice) and yoga mat rolled out. When you first start out on your morning practice journey, go easy on yourself and set a realistic time frame for your practice. Don’t set the expectation of doing a full 90 minute practice everyday because, unless you have no where else to be for the rest of the day, you will probably find this won’t stick. I generally set myself a time my practice needs to be finished by and have an alarm that goes off at that time, so the length of my practice can change depending on how long it takes me to get on the mat. As I have a set finish time, I can relax and enjoy my practice knowing I am giving myself enough time to get myself ready and out the door on time. 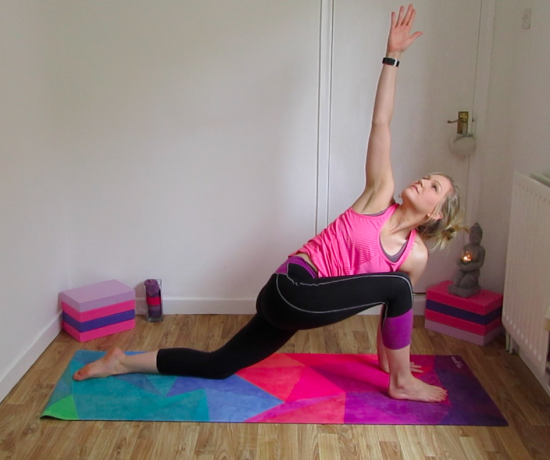 If you are not quite sure what to do during your morning practice then why not take a look at my video below that takes you through a nice gentle yoga sequence, perfect to get you awake and warmed-up. You can carry out this sequence alone or add in some standing poses and inversions afterwards. Check out my other videos on YouTube for ideas. Let me know how you get on and if you have any other benefits of morning practice that you have discovered after practicing.